Don’t follow the crowd – We’ve all received a wedding invitation that includes options for accommodations. Whether it’s a destination wedding or simply in a nearby city, couples often reserve a block of hotel rooms for their guests. However, don’t assume that this is the best rate available. Before you book any hotels this wedding season, visit a site like Expedia.ca to compare prices on accommodation near the wedding venue. Make it a vacation – Seventy-two per cent of Canadians dislike the costs associated with attending a wedding, such as travel and purchasing new attire. But before you cancel your summer vacation plans to attend a wedding, see if you can have it all! Consider adding a few extra days on either end of an out-of-town wedding to make it into a mini vacation. As a bonus, cash in those credit card rewards you’ve been saving up, and make sure you look for an online promo code on coupon sites like RetailMeNot.ca before booking everything from your flight to your rental car. Give the gift of lasting romance – For 69 per cent of Canadians, it’s the romantic experience that has guests gushing over weddings. With this in mind, never lose sight of the fact that it’s the thought that counts, especially when you’re planning that all important gift. I love the idea of a date night gift basket for the couple to enjoy after their honeymoon. 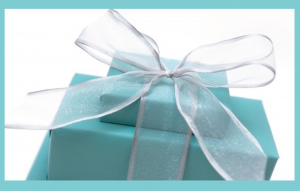 A perfect package could include a bottle of wine, a gift card to their favourite restaurant and candles to keep the romance going! Find the perfect outfit – Travel, gifts, wedding showers, bachelor parties…the costs of wedding season can skyrocket. Add new clothes and shoes into the mix and it’s easy to blow your budget with Canadians spending an average of $325 on wedding attire alone this season. To save this season, rent a designer dress. Check out sites like RentFrockRepeat, which allows you to rent designer dresses at a fraction of the cost. Still have the urge to splurge? If you do want to buy something new, opt for a classic black dress you can wear to more than one wedding and buy accessories to make it unique for each occasion. Retailers like Joe Fresh carry well-priced and stylish jewelry which can help to differentiate each look. 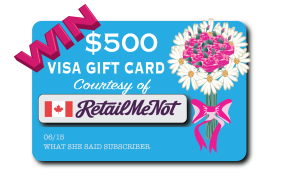 To give your budget a kick start this wedding season, RetailMeNot.ca is offering one lucky What She Said listener a chance to win a $500 Visa gift card! Click here to enter!